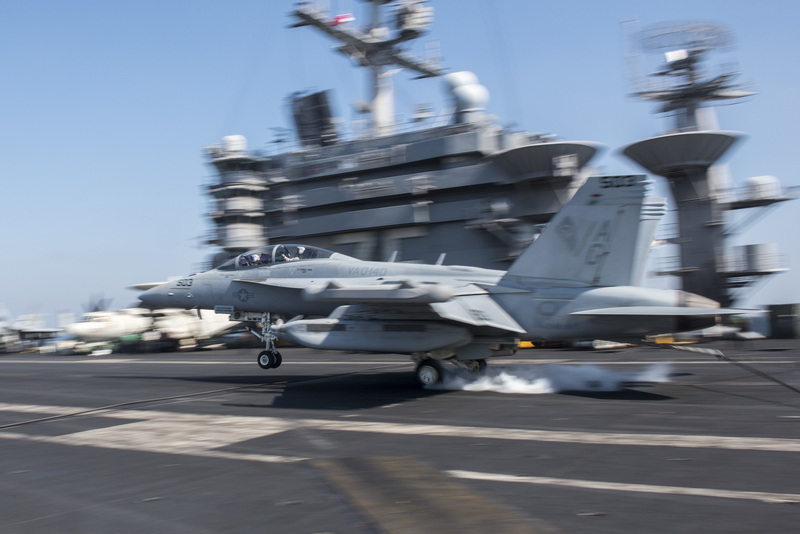 Home » Articles » The CVN, at Full Speed, But Going Where? 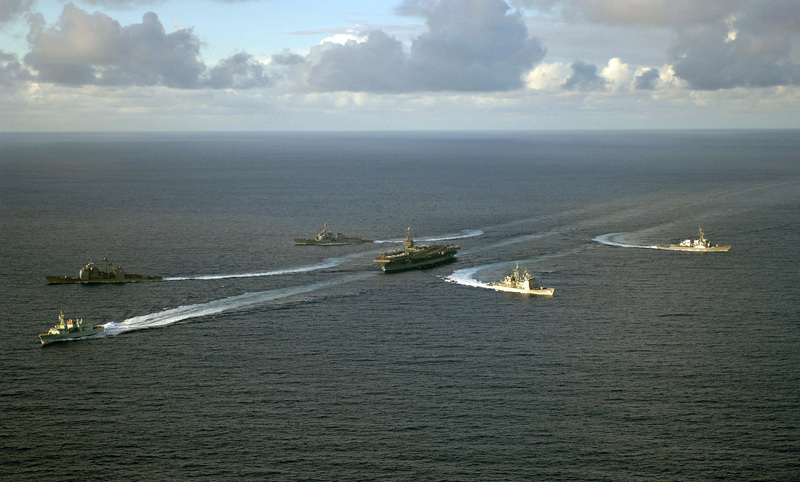 The CVN, at Full Speed, But Going Where? Is it time to reexamine the US Navy’s carrier program and future plans? The aircraft carrier Harry S. Truman battle group recently completed an eight-month combat deployment to the Middle East area. Her embarked Air Wing 7 “flew 2,054 combat sorties, expending 1,598 pieces of precision ordnance … to degrade ISIL resources and leadership,” according to Navy news release, which used an acronym for the Islamic State group. But in eight months — let’s say seven months (200 days) in theater—the Truman’s combat sorties averaged 10 per day. And, an average of about 0.78 pieces of ordnance were dropped per combat sortie. This is ridiculous! Those 10 combat sorties per day, each dropping less than one weapon per sortie, were flown from a 100,000-ton, nuclear-propelled warship manned by more than 5,000 men and women. Each combat sortie undoubtedly required one or more refuelings, either from US Air Force tankers or using an F/A-18 Hornet (or two) as a tanker. Of course, the Truman was escorted by cruisers and destroyers and required underway replenishment ships to provide aviation fuel plus food, cigarettes, toilet paper and other provisions for the crews. Another factor is ship availability. The Navy currently has 10 CVNs, or nuclear-propelled aircraft carriers, in commission, one of which is in a multiyear overhaul/nuclear refueling. The other nine ships can sustain only two or three ships forward-deployed in crisis-conflict areas at any time. Thus, more than 50,000 men and women in ships’ crews — plus support personnel — are required to keep three ships deployed, with usually only one in a conflict area flying about 10 combat missions per days. The cost of the next 100,000-ton, nuclear-propelled aircraft carrier is about $15 billion. Admittedly, these ships can operate for about 50 years. Still, when one considers their operating costs, their aircraft, their crews — including nuclear-trained personnel who are more expensive to train and retain than are “regular” sailors — plus the aircraft sitting on the flight and hangar decks that are not flying combat missions, the current carrier situation demands an objective and thorough review. The situation is exacerbated because of the severely limited capabilities of the current CVN air wings. Long-range strike capabilities disappeared with the retirement of the A-6 Intruder. Today, if the current F/A-18 Hornet strike fighter is used for long-range strike (i.e., beyond about 200 miles), it requires in-flight refueling; but because there are no tanker aircraft in the air wings, other F/A-18s must be employed in that role or — if available — Air Force tankers. The same situation exists for long-range combat air patrols since the demise of the long-range F-14 Tomcat aircraft. Can long-range strike be better carried out by the Navy’s 84 cruisers and destroyers and 56 attack submarines, all of which can launch long-range, highly accurate Tomahawk missiles? The missiles carry 1,000-pound conventional warheads, and the latest variant can be retargeted while in flight. And new, long-range, ship- and submarine-launched anti-ship missiles and tactics are being developed under the Navy’s Distributed Lethality program. Similarly, the CVN has no viable anti-submarine capabilities since retirement of the S-3 Viking aircraft. Even the current carrier-based helicopters are not anti-submarine configured but are rather MH-60s — the “M” indicating multi-mission. They support special operations, carry out surface surveillance, are employed for vertical replenishment, carry VIPs and, oh, yes, occasionally practice anti-submarine tactics. And long gone are the specialized reconnaissance aircraft, such as the RF-8 Crusader and RA-5C Vigilante. Today, tactical recon from carriers is flown by F/A-18s carrying sensor pods — limited systems flown by fighter, not dedicated recon pilots. Reconnaissance missions today are flown more effectively by satellites, UAVs and manned aircraft such as the U-2 and RC-135 than by pod-carrying F/A-18s. Thus, probably the most effective mission for the carrier is close-air support and on-call strike. But here, again, UAVs with Hellfire and other missiles could perform in those roles. This is especially true for the newer, very long-endurance aerial vehicles. However, there are innumerable scenarios where a man (or woman) in the cockpit is vital for close-air support and on-call strike. The arrival on scene of the Lockheed Martin F-35B Lightning may present new opportunities for carrier aviation. The “B” variant for the Marine Corps is a vertical and/or short takeoff and landing (VSTOL) aircraft. The Air Force — flying the F-35A variant — has been selling the Lightning as an effective close-air support platform to replace the aging A-10 Warthog. Thus, the F-35B could become the principal carrier aircraft — on smaller carriers. Today’s carrier situation cannot be sustained in terms of high dollar and people costs and (very) limited combat capabilities. At the same time, a new, smaller — possibly more efficient — carrier design would require a decade or more before the first ship could be laid down — and several years to build a prototype. Rather, a smaller carrier is already in production: the full-deck LHA/LHD amphibious ships. Displacing more than 40,000 tons, these ships are significantly larger than the 100-plane Essex carriers of World War II. And the feasibility of operating large numbers of VSTOL aircraft from these ships was demonstrated in the Gulf War in 2001 when three LHA/LHDs each operated 20 to 24 AV-8B Harrier VSTOL aircraft. No significant problems were encountered. Today, the Huntington Industries shipyard in Pascagoula, Mississippi, is building these ships at a cost of just more than $3 billion each. The new Gerald R. Ford-class carriers being built at the Huntington Industries shipyard in Newport News, Virginia, cost some $15 billion per ship. These 100,000-ton behemoths are being constructed at five-year intervals.. Thus, an option to be considered is to skip the next carrier — the CVN-80 — and in its place build one LHA/LHD per year — for the same cost and for the same crew requirements. Building them at Newport News would keep the yard’s employment at current levels, while the yard’s nuclear capabilities could be retained through its submarine construction and CVN overhaul/refuelings. Indeed, some analysts believe that if LHA/LHDs were built at the rate of one per year in place of a CVN, the multi-ship component orders could reduce costs so that six LHA/LHDs could be constructed for the cost of one CVN. Each of these ships could accommodate about 20 F-35B Lightnings plus a dozen or more helicopters — for anti-submarine warfare and other roles. Also, the US Marine Corps is planning an electronic attack variant of the F-35B. The feasibility of VSTOL operations from these ships means that the new cargo version of the MV-22 Osprey could easily operate from these ships (replacing the C-2 Greyhound in the carrier-onboard delivery role). Further, there have been studies of the feasibility of operating the Osprey in the anti-submarine and airborne early warning (AEW) roles. The British, Chinese and Russian navies have flown helicopters in the AEW role with success. Accordingly, an LHA/LHD — while not a replacement for a CVN — could provide the fleet with significant capabilities in a key area at a fraction of a CVN’s cost. Indeed, the question must be asked of the combatant commanders: Would they rather have another CVN in their operating area, or five or six LHA/LHDs with F-35B and V-22 VSTOL, plus helicopter capabilities? The nuclear super carriers Ford and Enterprise, now under construction, should be completed. But in this environment with the severe limitations and costs of the current carrier force, a broad and objective review of requirements, capabilities and alternatives must be undertaken before funds are spent on additional ships of this type. Norman Polmar is an author, analyst and consultant specializing in naval, aviation and technology issues. He has been a consultant/adviser to three US senators, a Speaker of the House, three secretaries of the US Navy and two chiefs of naval operations.